As the furor over Mass Effect 3 continues to roil, BioWare says it hasn't actually closed the door on the possibility of changing the ending. 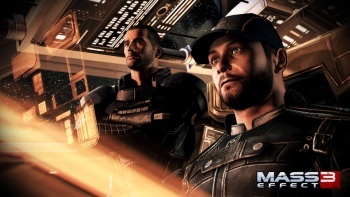 It's not easy to avoid Mass Effect 3 endgame spoilers because that seems to be the only thing anyone wants to talk about: How an otherwise excellent game crashes and burns in spectacular fashion in the last ten, grossly unsatisfying minutes. The ending is apparently so bad that it's transcended the usual internet petitions and led some aggrieved gamers to actually urge an FTC complaint against BioWare for false advertising. BioWare hasn't yet commented on that rather extreme course of action but it has now indicated that it's open to the idea of changing the ending, or, more precisely, that it's not flat-out refusing to do so despite previously suggesting that such a move wasn't in the cards. "We are aware that there are concerns about a recent post from this account regarding the ending of the game. In this post it was stated that at this time we do not have plans to change the ending," the studio wrote on the Mass Effect Facebook page. "We would like to clarify that we are actively and seriously taking all player feedback into consideration and have ruled nothing out. At this time we are still collecting and considering your feedback and have not made a decision regarding requests to change the ending," it continued. "Your feedback and opinions are of the utmost importance to us. We apologize for any confusion this has caused. Our top priority regarding this discussion is to keep communication with you, our loyal fans, open and productive." I'm down with the idea of open and productive communication with fans [although runaway incivility rarely seems far behind] but I still think the idea of demanding a new and "better" ending is ludicrous. I don't really have a stake in either side of this debate, although I think it's absolutely fantastic that the Retake Mass Effect - Child's Play donation drive has so far raised over $67,000, but you don't paint a new smile on the Mona Lisa just because the original's a bit flat.